With this brilliant novel about the surprises of destiny and the origins of fame, the critically acclaimed author of Golden Days ("Extraordinary . . . a very, very important book"-Los Angeles Times Book Review) and Making History ("Radiant . . . exciting and imaginative"-Cleveland Plain Dealer) firmly establishes her place as one of the preeminent chroniclers of our times. The Handyman is the story of Bob Hampton, an aspiring young painter who has had to face the humbling fact that he doesn't know what to paint. And how are you supposed to be an artist in this world if you don't have a vision? Bob trades in his artist's palette for a minivan full of house paints, hammers, and nails, and sets about earning a little cash as a handyman. Although he turns out to be very bad at fixing the things he's hired to fix, Bob demonstrates quite a knack for fixing the lives of the people around him. In the midst of his jerry-built repairs and inspired home improvements, Bob meets an extraordinary cast of characters--rendered in all their delightful eccentricity and human frailty as only Carolyn See can-each of whom shows Bob the true scope of his own remarkable talent. There's Angela Landry, a housewife with far too much time on her hands, a sexpot of a stepdaughter, and a son in need of attention; Jamie Walker, whose allergy-prone and ADD-afflicted children keep a menagerie of scaly pets that far exceed Jamie's managerial skills; Valerie LeClerc, older, sadder, and certainly wiser than Bob; and Hank and Ben, who leave a narrow-minded Midwest only to find unremitting illness and isolation in the California of their dreams. 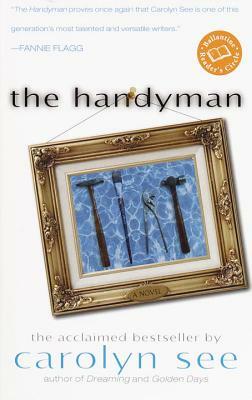 Replete with stunning images and all of Carolyn See's trademark humor and wisdom, The Handyman depicts the countless ways in which our lives are intertwined and the profound effects we can have on one another. It is the kind of surprising and miraculously uplifting novel we have come to expect from the woman Diane Johnson has called "one of our most important writers." Carolyn See is the author of nine books. She is the Friday-morning reviewer for The Washington Post, and she has been on the boards of the National Book Critics Circle and PEN/West International. She has won both Guggenheim and Getty fellowships and currently teaches English at UCLA. She lives in Pacific Palisades, California. "The Handyman proves once again that Carolyn See is one of this generation's most talented and versatile writers." "IRRESISTIBLE . . . A SPARKLING ENTERTAINMENT." "BEGUILING, CHARMING, WITTY, INSPIRING--Carolyn See's novel The Handyman is so wonderful in so many ways that it's going to seem as if her mother wrote every review for it. Twenty-eight-year-old Bob Hampton is a struggling artist who is panicking at the possibility that he will never find his authentic 'voice.' After a failed (and endearing) trip to Paris, Bob returns to his home in Los Angeles and decides to spend the summer working as a handyman before giving art school one more try. What he becomes, of course, is a handyman of the heart." "[AN] INVENTIVE AND ENERGETIC STORY . . . See offers a satisfying take on the mysterious and unpredictable ways that real life can be turned into art."